Synopsis: In the year 2154, the very wealthy live on a man-made space station while the rest of the population resides on a ruined Earth. A man takes on a mission that could bring equality to the polarized worlds. It’s the middle of the 21st Century and — wouldn’t you know it? — the world’s in a bit of a state. In fact, the planet has become so polluted and over-populated that its wealthiest citizens have fled to the huge space-wheel Elysium, in which a synthetic paradise of verdant green fields and silvery-blue lakes has been created. Life is so good for these lucky few that each house contains a pod which will cure the occupant of whatever ails them, whether its leukaemia or radiation poisoning which, as it happens, is highly relevant to the tale District 9 director Neil Blomkamp is about to tell us. Only a tiny fraction of Earth’s population can afford to stake a claim on Elysium, leaving a disgruntled majority scrabbling around to survive on a world in which society seems to be barely functioning. Now, this ailing society is probably going to prove rather troubling to the attentive viewer, because as far as I can see, despite high unemployment levels, it’s the workers on Earth who are producing the machines and other materials and produce required to keep the privileged few in the lifestyle to which they’re accustomed. A world in which jobs — even production line ones — are quite clearly at a premium is one in which the economy is in dire straits and is, quite frankly, unsustainable. In Los Angeles — which looks a lot like the barrios of Mexico (probably because that’s where it was shot) — scruffy urchins beg in gangs on the streets, and the citizens are marshalled by authoritarian robots that can search and arrest at will. Nobody looks as if they’ve washed for a week. Basically, America — and presumably the rest of the world — has become a totalitarian state whose subjects live in such grinding poverty that public unrest and/or uprising can only be weeks away. And while Elysium sort-of addresses this situation, it does so in such an obviously unrealistic manner that can only be put down to laziness on the part of Blomkamp, who wrote as well as directed. Every now and then a group of bedraggled refugees clamber aboard an illegal, rundown shuttle to Elysium which is organised by a chap called Spider (Wagner Moura — Elite Squad 2), whose motives are murky at best, but who ends up coming across as some kind of altruistic gangster. Presumably a seat aboard this shuttle comes at a price — after all, we’re not talking about ferrying a group of immigrants across a border line in the dead of night; even though Elysium is only 19 minutes away, it still takes an awful lot of fuel to get there — but no clue is given to quite how they manage to pay for a seat, these impoverished Hispanics. Anyway, judging by the fate met by two of the three craft that attempt to reach Elysium, Spider’s trips have only a 33% success rate of reaching their destination, and even then the lucky third are rounded up almost the moment their feet hit the lush grass. We do see one mother slip through the welcoming committee and force entry into a home where she inserts her crippled daughter into one of those pods which, after a quick scan, allows the little girl to throw away her crutches. It seems that reaching Elysium for its medical treatment — which presumably the rich withhold from the poor out of sheer spite, as no other reason is given — is probably a more common objective than finding a new life amongst the world’s wealthiest 1%. Back on Earth, Max (a shaven-headed Matt Damon — The Departed, Ocean’s Twelve) is an ex-con struggling to go straight. Somehow, despite his criminal record, he’s managed to find a job with Armadyne, the company that makes the oppressive robots which ensure the masses remain oppressed, but an accident involving a jammed door and a large amount of stupidity result in him receiving a lethal dose of radiation which — as an emotionless medical robot informs him — will result in catastrophic organ failure in just five days. As an orphan child, Max always dreamed of one day living on Elysium, and now that dream has suddenly become an absolute necessity if he’s going to survive beyond day five. With the help of his friend Julio (Diego Luna – Contraband), Max visits Spider, who agrees to provide him with a place on the next flight to Elysium on condition that Max carries out a risky job that even his men are unwilling to attempt. He must abduct a member of the ruling class and download the data in their brain — effectively stealing all their sensitive information regarding bulging bank accounts and so forth. Max agrees on the condition that the victim is John Carlyle (William Fichtner — The Dark Knight, The Lone Ranger), the head of Armadyne who was so unconcerned by Max’s fatal condition. What Max doesn’t know is that Carlyle has just written and downloaded to his brain a program designed to stop and reboot the Elysium operating software so that the scheming and glacially bitchy Defence Secretary Delacourt (Jodie Foster, lending some quality to proceedings despite phoning in her performance) can carry out a coup that will oust the wussy President Patel (Faran Tahir), who keeps prissily complaining whenever she blows up one of them pesky Spider-shuttles. This wouldn’t be so bad if it wasn’t for the fact that Carlyle is accidentally shot during the abduction, and Max and his mates have just enough time to park Carlyle’s data in Max’s head before the CEO of Armadyne dies from a heart attack. This means that if Ms. Delacourt’s planned coup is to take place at all she must extract the information from Max’s head by any means necessary. To achieve this she unleashes Kruger (Sharlto Copley), a near-feral South African with the instruction to get Max to Elysium by any means possible. Somewhere around the halfway mark, the allegorical aspect of Elysium runs out of steam and Blomkamp focuses instead on having people run around and making things go boom. The South African director is tapping into the unease felt by today’s inhabitants of the world’s wealthier countries, but that tactic backfires because his target audience are those portrayed as the bad guys in his movie. In 2013, 8.4% of adults owned 83.4% of all household wealth, and that 8.4% – that’s you and me — are growing increasingly edgy about all those immigrants flooding our shores. In 2014, Switzerland re-introduced strict quotas on immigration from EU countries, and while its neighbours condemned their action, they are undoubtedly coming under increased pressure from their own citizens to do something about the number of foreigners coming to their country in search of work, benefits or free healthcare. To incorporate this situation into an SF movie allows its writer and director near-unlimited licence to create a scathing condemnation of our double standards, but Blomkamp shamefully cops out when it matters, providing us with a horribly unrealistic and idealistic finale which, in reality, would be just as unworkable as the totalitarian state created by that lucky 1% to keep the great unwashed in their place. To compound this major bungling, Blomkamp displays a shocking lack of confidence in the intelligence of his audience. Information is dispensed in easily-digestible mouthfuls with an occasional flashback to aid our recollection. His characters are broad stereotypes, his villain’s villainous credentials explained to us in insultingly condescending tones: Delacourt blows up defenceless immigrants, Carlyle sniffily orders the poisoned Max to be ejected from the plant following his accident, and Kruger throws bottles of beer at the starving masses as he cooks his barbecue. Honestly, he might as well have them wearing black hats or twirling waxed moustaches. 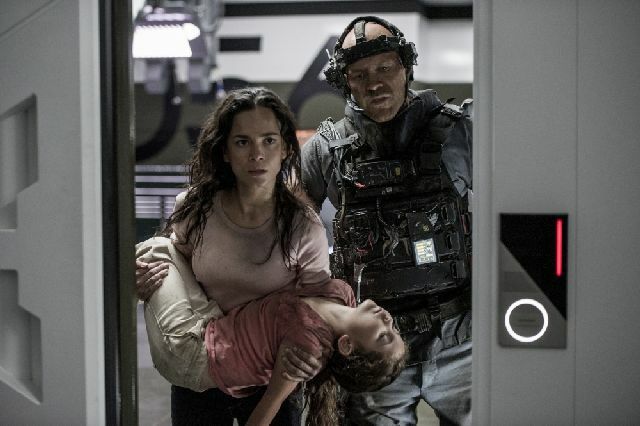 The action is admittedly entertaining in a mindless, turn-off-your-brain way, and the movie looks terrific, especially Blomkamp’s vision of an over-populated Los Angeles, but there’s so much that’s wrong with Elysium that these few positives simply aren’t enough to overcome all the negatives.